2. The machine adopts computer control system, servo motor structure. 3. With functions such as photocell automatic tracking, blank/ color bag-making shift, microcomputer length setting, automatic counting, automatic alarm when reaching the set figure, automatic temperature control. 4. Equipped with mechanical device for functions such as auto cutting, punch hole, half-round hole, strip-go-through, strip moving, side sealing, bottom sealing, point-cutting, folding, continuous rolled and roll separate etc. 5. 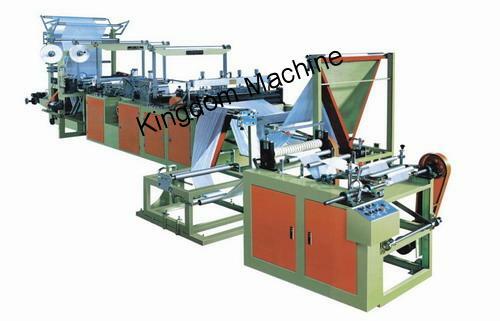 This machine can produce continuous-rolled strip-through type garbage bag, continuous-roll flat bag and normal flat bag.